Have you hit a plateau with your weight loss? Need a new way to mix up your workouts? Got a special event coming up that you want to prep for? Then this is the program for you! This custom 14-day plan includes a specific rotation of high intensity interval Tabata training, metabolic conditioning, active recovery walking, core stretching and even barre workouts to help you get maximum results in minimal time. You can complete it at anytime at your own pace following our custom rotation, as outlined below. All you need to join in is our “Ultimate Workouts for Weight Loss” 4-DVD Set (available on Amazon here or for digital download here) which includes our previously released Cardio Abs, Walking for Weight Loss, Total Body Balance and Barre Fitness DVDs (also available separately for purchase in case you already own a few but not all 4). This plateau-busting plan is a structured, customized workout rotation designed to help you maximize your weight loss results by mixing up a variety of workout styles, lengths and intensities. Be sure to pair your workouts with a healthy diet, plenty of water, sleep and enjoyable, daily activity for best results! Day 7: ACTIVE REST DAY! Do something fun and active that you enjoy – take a bike ride with the kids, play freeze tag or tend to your garden. Day 14: ACTIVE REST DAY! Do something fun and active that you enjoy. Want to continue beyond the 14 days? Feel free to start the rotation over once you’ve completed 1 round. Listen for more advanced options within each workout and feel free to add the additional challenge during your 2nd time through the rotation. Any chance of the DVD’s being done on region 2 as my DVD player doesn’t play region 1. I’m in the UK and found some DVD’s I would like to try but unfortunately they’re only available in the US. Not a big fan of downloads!!! What format does the digital download come in? MP4, WMV or other? Thanks! I love your workouts! Day 1 complete! Just did all 3 Walk On programs, 4 weeks Plug & Play and decided to get my challenge on! Love having all jess options to stay healthy and strong! I finished the Fall 2016 Challenge on Saturday and I wanted to do something different before going back to the very beginning of Walk Strong so I opted to start this yesterday. It’s been so long since I’ve done most of these workouts, especially the abs DVDs, loving that it’s a challenge, feels like something new for sure! I really like that there are so many different options to choose from on this site and with the Walk Strong programs. It’s nice to get back to older workouts that definitely feel like brand new ones. I see Total Body Balance is included in this rotation, but the DVD doesn’t appear to be available anymore, although there is a download option. Is there a way I can purchase this DVD, or do you recommend replacement workouts? I’m on the last week of the 6 Week Phase 2 program and loved it – great results. Is the Phase 3 program available? If not, do you have a suggestion on what I should do next? Hi Karen! Thanks so much for joining us for the program! We do have a phase 3 [also called Walk STRONG 2.0] available here: http://walkonwalkstrong.com/wp-content/uploads/2016/05/Phase3.pdf We’d love to have you join us for the program! Isn’t the 14 Day Challenge (4 DVD Collection) still available through digital download? I just completed the 6 week workout and loved it! I went to Amazon to try and order the 14 Day Challenge and it said it was not available and didn’t know when or if it would be again. Is there anywhere else I can order? I just wanted to than you, Jessica for creating such great videos and programs. I started out with your free YouTube videos and recently purchased the Walk On 21 Day Weight Loss Plan. This is the first program I have purchased and have actually stuck with. I am enjoying the program and I am telling everyone I know about Jessica Smith TV and your other programs. I can see and feel the difference in my fitness level and my family and friends can see a physical difference (woohoo). I can’t wait to get the 6 Week Total Transformation. That’s awesome Cara! Congrats to you on all of your hard work 🙂 We’re so glad you are here with us and can’t wait to continue on with you to the next plan once you are ready! Keep up the great work you are doing taking care of your body and your health! wondering where I can find the meal plan and workout calendar for the 14 day program. 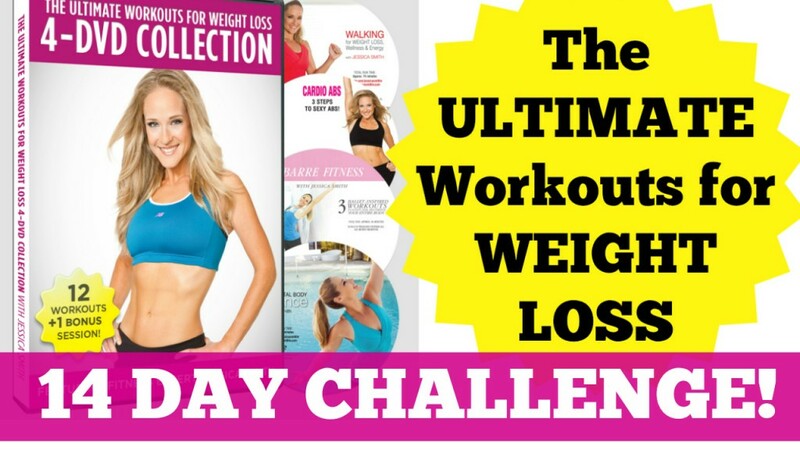 Love the Ultimate Workouts for Weight Loss 4-DVD Collection. Where can I put up the white plastic chair. Used a chair in the house but it is too high so I wasted a lot of time trying to adjust. Help!!!! Love all your programs. By the way, loved your 21 day plan! Its the ONLY plan that I have stuck to in years!!! Hello Jessica! I’d like to thank you for your workouts, I like it so much! You’re incredible and very talented woman. Also thanks for the opportunity to buy the workouts as a digital video, because it was not very convenient to buy it at amazon.com. With best regards from Moscow, Vera. No question .. Just can’t wait to order your DVD. Hi! I enjoy your workouts on YouTube, and I really want to purchase this from Amazon, but it hasn’t been available for awhile. Do you know when it will be available? Thank you for your help! When will this DVD set be available again on Amazon? They have so many awesome reviews. I’m on day 8 and never thought I’d be able to do the whole Barre DVD in one session. Then again, I never thought I’d be able to do your Cardio Abs DVD, let alone the Tabata routine, but huffing and puffing and taking short breaks, I did it. Also, I think it’s the first time I stick to a program for a whole week, and I’m sure it’s cause I’m NEVER BORED when I do your workouts. Love your workouts, your fitness philosopy and your smile, thank you for your hard work! I just want to recommend this program to everyone: 12 different workouts (+ the dreaded Tabata) so you never get bored, different styles (cardio, barre, sculpt, interval, strenght…), 2-3 short videos per day, so you can break it in two sessions (for week 2 I sometimes did morning and evening). I just finished it for the second time and I was most impressed by the improvement in my endurance, it really is unbelivable what a litte consistance can do. In my opinion is more demanding that the first “Walk on” program (I haven’t done the 21 days yet) but there are a lot of modifications for beginners and if you listen to your body you know when it’s too much (ah, that Tabata). For me it’s worth every cent, and then some. Thanks so much for sharing your experience Ale! We would be so grateful if you’d also post it as a review on Amazon as well so that potential exercisers can decide if it’s the right program for them 🙂 Thanks for moving with us! The only place I could find the 4 DVDs together is Amazon UK and I reviewed it. You already have a lot of wonderful comments on the US site, so I’ll post on Amazon France and Italy. Congratulatins on making number 4 on the best online fitness resources list! Well deserved. Thank you Alessandra! We so appreciate your review 🙂 Thanks for moving with us! Thanks for a fun but challenging (some days very!) workout! I am almost done with Week 2 of this and feel awesome. It’s pretty great how much more we can do than we think we can 🙂 I am going to start over again next week, see if I can’t go harder the 2nd time around. Do you have any plans for your other walking DVDs? I feel like there was something a while back but can’t seem to find it. Looking forward to your next challenge – you rock! Thank you! Great! Feel free to add in Zumba – I’d just do it instead of that day’s routines and then jump back into the challenge the day after… all of it might be too much 🙂 Thanks for taking the challenge – please let us know how it goes!